If you have kids, have you organized your kitchen with them in mind? I’m not just talking about putting the knives out of reach, but putting the things the kids use WITHIN reach! 1. 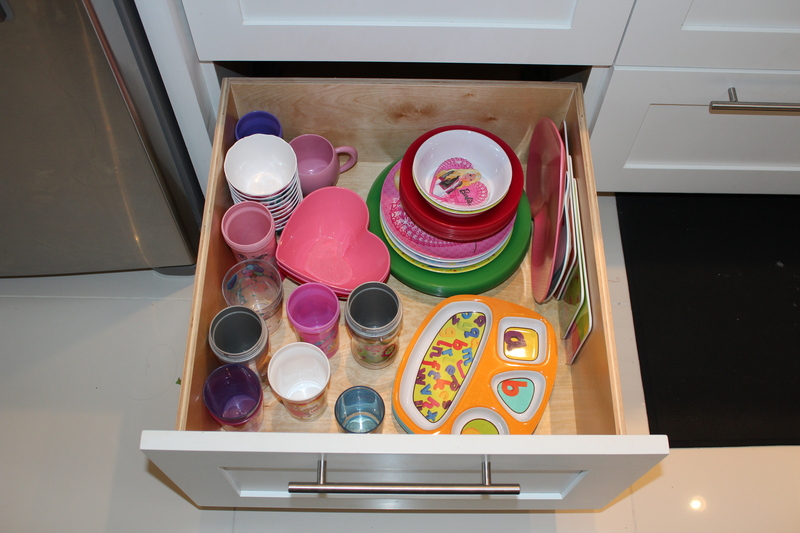 Put kids’ utensils, plates, and cups in a low drawer. Then, when it’s time for dinner, make THEM be the ones to get them out and set the table! 2. Put other things kids use, like homework and art supplies, near the work surface they’ll use them on. I have my kids’ art supplies in the dining room hutch. After all, they do all their artwork at the table and it makes cleanup before dinner a breeze to have the art supplies right next to the table! I hope that this website is beginning to inspire you to find creative ways to organize your life. It’s not just about making your home look good, but about making your life a little less chaotic and more peaceful! This entry was posted in Crafts, Decorating, Dining Room, Favorite Things, Home Organizing, Kids, Kitchen, Quick Tips and tagged art supplies, cups, dishes, school supplies by organizedohana. Bookmark the permalink. Can I just tell you how much I love your blog! I actually have it scheduled for Sunday to write about some kitchen organization techniques I found on Pintrest that I’ve implemented in my lifestyle. A child’s drawer in reach is one of my favorite things. It keeps the clutter clear of uneven plates being strewn about in the grown up cabinets. It also helps teach color and size as Jude’s plates and bowls are very similar in depth. I’ll be sure to link your blog for some of your other creative ideas. Looking forward to more posts! Back when my older two were very little (2 and 4), I even kept the silver ware and our normal plates and bowls (the less easy to break ones) in a hutch at their level. This made it so easy for them to help me put the dishes up out of the dishwasher and sort the silver ware. Now, our children have their own part of the kitchen with all of their things including dishes, Romen noodles, their breakfast cereal and stuff. I love having it all at their reach. Grandma has done this in my Wales house– the kids can reach all the things they need and are safe with. I also have step stools handy in the bathroom (for hand-washing and tooth-brushing) and kitchen (so little hands can help with meal prep). Their aprons hang on kid-level hooks, too. Love your blog– you CAN teach us oldies some new tricks!– and love the painting over your dining room hutch!